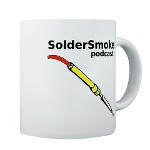 SolderSmoke Podcast #159 is available. An (Almost) All Altoid Crystal Radio! Ah, it was a good morning in the N2CQR shack! Last week I ran into fellow ham David Cowhig at work. I was regaling him with tales of Herring Aid and Tuna Tin derring-do. Oh the stations I had heard with the receiver! And the stations that I'd worked with the transmitter! Then David asked the question: "Yea, but have you worked anybody with the receiver paired up with the transmitter?" Uh, no. Not yet. Well this morning I took care of that. 7040 kc. 1115 UTC. W4ELP was calling CQ. He wasn't too strong, and I wasn't sure if we were on the same side of zero beat (that's what happens with direct conversion -- you get all the sigs in two places on the dial) but I took a shot at it. And he heard me! Here's the icing on the cake: This was his SECOND QSO with my Tuna Tin 2! Ed had been contact #4 when I was running the TT2 with the Drake 2B. 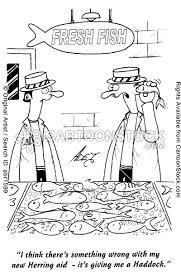 After exchanging reports he asked "Bill ARE YOU STILL ON THE TUNA TIN?" The rig (TX AND RX) is pictured above. Close-up of the receiver appears below. And below that is a picture of Ed, W4ELP, in his Georgia shack. Note the HW-8. 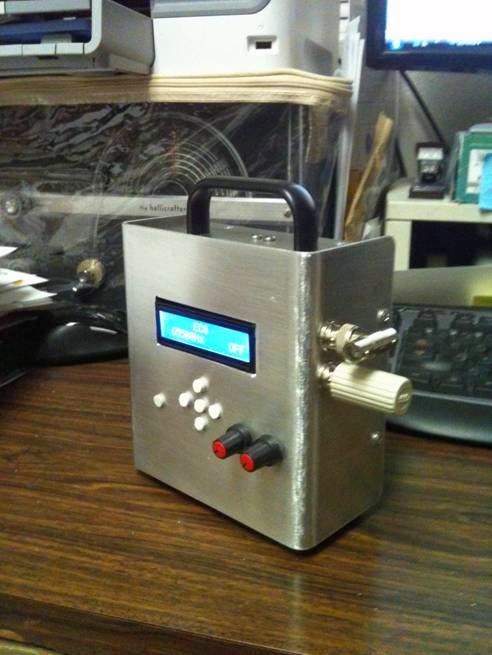 Nice looking DDS function generator Harv! Glad to see the HT-37 in the background. (And it appears well protected -- is that some sort of digital shielding to protect it from the bits and bytes?) The eraser buttons are a nice touch. Good luck with the Minima! Well I have nearly completed my DDS Function Generator as I prepare to construct the Minima. The Function Generator was a necessity for the bench so I can tackle Tweaking and Troubleshooting my work. It is housed an aluminum box and completely self-contained. My objective was to have the choice, to either lay the unit flat on the work surface or stand it on a shelf for easy reading while seated. The Generator has both a DDS and HF-ECG output. The buttons are fashioned from White Pencil Erasers since finding proper buttons for the membrane keypad beneath was difficult. I have obtained a set of Farhan’s Boards for the Minima but will begin my effort with a Manhattan Style Construction so I can perfect my choice of parts. The soldering iron is heating and I’m ready for a new and exciting challenge. Now for something completely different! I signed up and downloaded the software. It works very well. 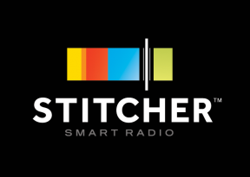 Many of the stations are closed to outsiders, and some of them don't let you transmit, but it is fun to listen from remote locations. This morning I hooked up the Tuna Tin 2 and was able to hear my 200 mW signal through AI4W's receiver in Kentucky. 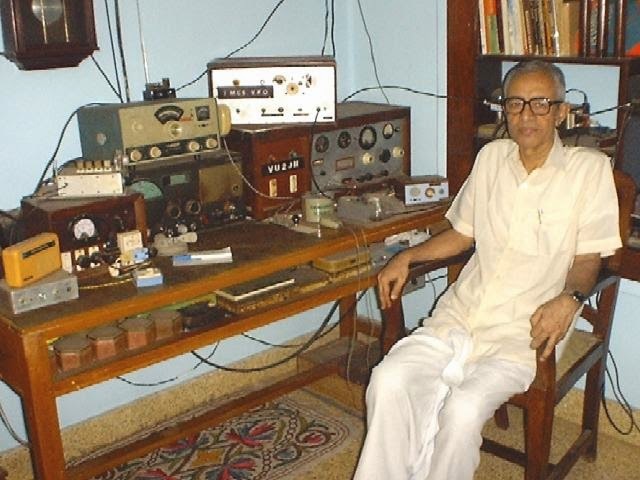 VU2JN's "Transistor Transmitter from India"
The signals that were announced this week are a bit outside our normal frequency range, but this is a REALLY BIG discovery so of course, it needs to be covered by SolderSmoke Daily News. I liked this info-graphic from space.com. It is worth looking at. Note the line "The universe continues infinitely outside Earth's Hubble volume." 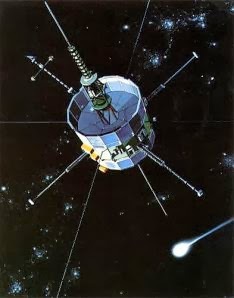 Source SPACE.com: All about our solar system, outer space and exploration. My feelings about regenerative receivers and their possible connections to the nether-world are well known. But the receiver described on this beautiful British web site is almost enough to make me change my mind. 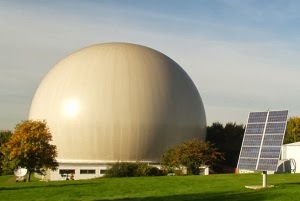 Thanks to Stephen, G7VFY, for alerting me to this (and to so many other great sites!) I also find myself forced to give regens another chance because George Dobbs, G3RJV, was the original source of this design. It comes from a book he wrote in 1972. I love the wooden bread-board construction. Thanks Stephen! Thanks George! FIXED! Following up on suggestions from Tony Fishpool and from Roy Morgan, I put a 10 ohm resistor between the two supply lines and put 100 uF caps to ground at either end of the resistor. I can now operate the receiver at high AF gain (no problem running a speaker) without the KLUDGE of two power supplies. The RX sounds great. I will soon match it up with the equally awesome Tuna Tin 2 for 1976 QRP EXTRAVAGANZA. The Herring Aid 5 is a direct conversion receiver (scroll down for details). It is a minimalist design from 1976 using parts available at Radio Shack stores. One of the parts no longer carried by Radio Shack is a 10K-2K ohm audio transformer. Following NORCAL's 1998 design update I ordered an equivalent Mouser part (Xicon 42TU002-RC). I had been running the receiver with simple RC coupling instead of the transformer. Yesterday the Mouser part arrived and I put it into the circuit. An increase in AF gain was immediately apparent, but the thing went into AF oscillation as soon as I turned up the AF gain. I tried beefing up the AF decoupling. But I think the real problem is just the presence in the middle of the board of a rather large (1 inch x 1 inch) audio transformer. I moved it around a bit to get it away from the toroid of the preceding stage. This helped a bit, but it still breaks into oscillation if I turn up the AF gain. Any suggestions? Or is this just part of the minimalist 1976 lifestyle? I didn't plan on doing this. I didn't even really want to do this. I've become a phone guy -- I'm not into CW anymore. I figured I'd just finish the Herring Aid 5 receiver and settle the score from 1976 and that would be it. But everything I read about the Herring Aid 5 included references to the iconic Tuna Tin 2. Obviously I was also under the strong influence of my late February encounter with the original TT2 at the Vienna Wireless Winterfest. That Mojo is powerful stuff! Then my wife brought home this can of Russian tuna. The dimensions were perfect. Then I looked in my junkbox and found 40 meter CW crystals. That was it. I had to do it. I built mine Manhattan style, using several of W1REX's fantastic Me-pads. I also used as the final a transistor that Rex gave me at Winterfest. Thanks Rex. Soul in the New Machine. I'm getting about 200 mW out. I;m on 7030 kHz and 7040 kHz and 7110 kHz. I have the TT2 up with my Drake 2-B (Herring Aid 5 integration will come later). I can feel the Mojo. I just had my first contact with the TT2: I called CQ on 7110 and AB2RA came back. 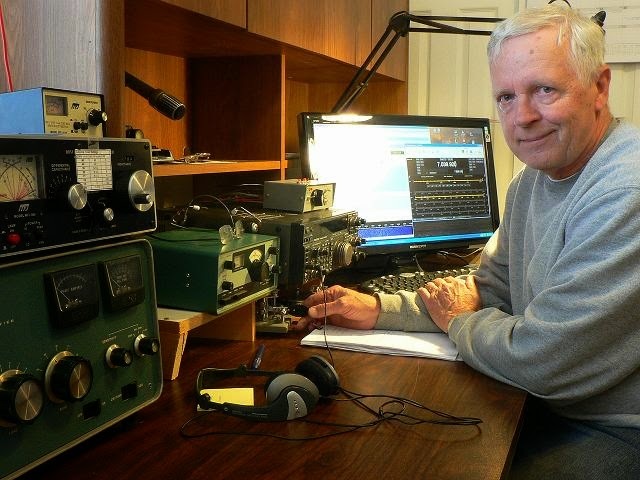 Jan was running 20 watts from an old 807 rig, listening with an old Hammarlund. So it was HB transmitter and vintage receivers on both ends! FB! Sure, this receiver is not "state of the art." But that's the whole point. 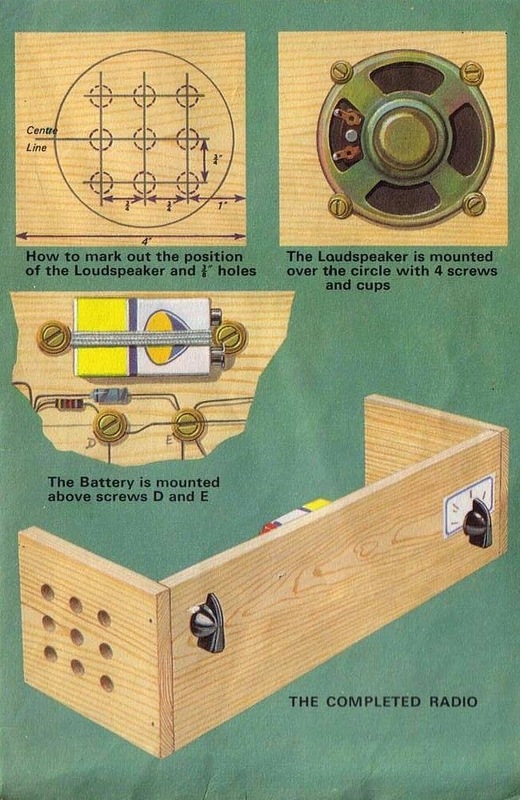 I wanted to finish the receiver project that I couldn't finish back in 1976. I tried to stick as close as possible to the original design and parts. NORCAL came up with an updated schematic in 1998 with parts that are more readily available. But Designer Jay Rusgrove was shooting for something that could be built with all the parts coming from Radio Shack. I think that is probably one of the factors that attracted me to the project way back when. That's why Jay went with varactor tuning (no hard-to-get variable caps!). And that's why he used coils that were wound on Radio Shack 10uH RF chokes (no need for hard-to-find toroidal cores). In this sense there is some common ground between the BITX rigs and the Herring Aid 5. I stuck with the RF-choke as a coil idea for the VFO, but went with the NORCAL-prescribed toroids for the front end and mixer coils. (I may go back and try to use chokes in these circuits, but I'm not sure my junk-box will yield the kind of RF chokes that Jay used). I wish I had known a few things when I was building this back in 1976: More knowledge about how to wind the coils would have been a big help. I wish I had realized that I could use a SW receiver to get the oscillator on the right frequency. I guess this was in the days before Ugly and Manhattan building techniques, but it would have been nice to know that there was no need to actually etch a board for this project (I did!). The coils really are a bit tricky. Jay didn't use any trimmer caps, so I guess you had to just hope that the front end coil and cap resonated somewhere near 40 meters. As for tuning the oscillator, Jay recommended scrunching and un-scrunching the turns on the RF choke. Yikes! Give me some trimmer caps! I also found that you have to watch the level of the RF going from the oscillator to the mixer. Too much, and the receiver is deaf. Too little, same result. You need to experiment a bit with the number of turns on the pick-up coil from the oscillator. The warnings about the pitfalls of that single BJT mixer were right on the mark: Lots of AM SW breakthrough. But I kind of like the background music. Strong RFI from local FM broadcast stations was another story (WMZQ is a country music station!). 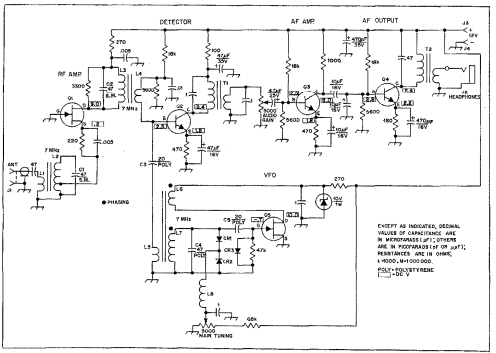 I reached into my junkbox and found a low-pass filter from a Heathkit DX-60. I just put that between the antenna and the receiver and the country music was GONE! I really love this little receiver. I have it playing 40 meter CW as I type. It sounds great. I feel the urge to built a Tuna Tin 2 and put both of them on 40. In the original Tuna Tin 2 article, Doug DeMaw notes that Jay Rusgrove was thinking of doing a companion receiver and says that he was thinking of calling it the "Clam Can 5" ! 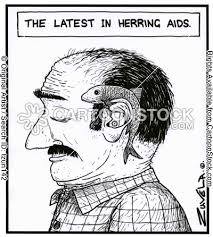 There were jokes about receivers for hams with "tin ears" and about there being "something fishy" about these rigs. Thanks to Doug DeMaw and Jay Rusgrove and QST for bringing us these little circuits. Herring Aid 5: Working after 38 years! I know, it is just a little Direct Conversion receiver. Getting it going is no great technical achievement. But this little receiver gave me such trouble as a teenager, it has been in the back of my mind for a long time. Finally, yesterday afternoon it started picking up signals. I felt a bit bad about insinuating (a few days ago -- see below) that QST may have made an error in the 1976 schematic. They didn't. So it was kind of spooky when I heard that first call-sign coming through the speaker: It was W1AW! It was as if they were saying: "See, the schematic was correct!" My second attempt at building a Herring Aid 5 (the first was 1976) continues. I had failed to check the rotational sense of the windings. The schematic called for 4 turns over the Radio Shack choke. So I just went ahead and wound them. I didn't pay any attention to the direction of the winding. I then hooked it up in accordance with the phasing dots in the diagram. And it didn't work. So I switched the coil connections around. And it worked. Aha! I thought! QST messed up! It wasn't my fault. Dex brought me back to reality. He noted that I probably wound the coils with the wrong rotational sense. I confirmed this. I rewound the coil following the rotational sense of the choke. I hooked it up following the phasing dots of the schematic. This time the oscillator started right up. So the problem wasn't an incorrect drawing of the phasing dots. Instead it was my failure to remember that phasing is more than just the top or the bottom of a transformer's winding. Rotational sense is also important. That's why "phasing dots" are sometimes referred to as "sense dots." " Used on transformer windings to identify those leads having the same instantaneous polarity." This morning I did a little experiment to confirm all this: I took a toroidal core and wound a little transformer. Using a dual trace scope, I looked at the input and output wave forms. Sure enough, when the windings are in the same rotational sense, there is no phase shift. But when that secondary is wound in the opposite sense, you get a 180 degree phase shift. I know this is very basic, but it was fun to re-learn it and to confirm is. But I still don't have the little receiver running. I think there are a few problems. 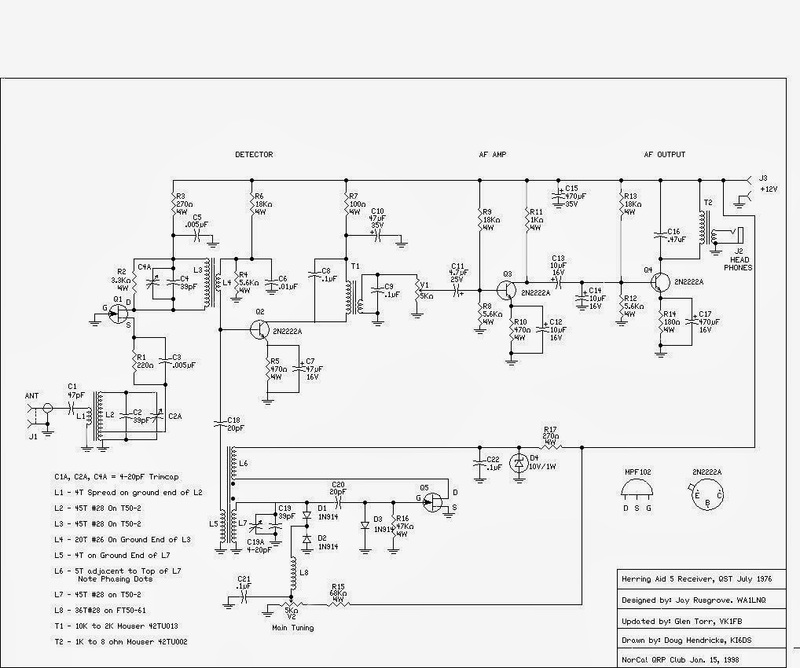 That single BJT mixer stage needs a lot of RF (2.5 volts p-p) from the oscillator. Also, I think the 10 uH chokes that I am using are not the same as the chokes used in the original Herring Aid design. So when I build transformers on these chokes, they don't work very well. But I will keep at it. It has been 38 years... I can wait another week or two. 38 Year HB Mystery Solved? Was it the phasing dots? During the summer of 1976, at the age of 18, I made an audacious attempt to join the ranks of the true homebrewers. I tried to build a receiver. It was the Herring Aid 5 from the July 1976 issue of QST, a 40 meter Direct Conversion receiver intended for use with the famed Tuna Tin 2. As I have recounted (perhaps ad nauseum), I never got it to work. My recent encounter with the ORIGINAL Tuna Tin 2 (Mojo was transferred to my BITX17, and it definitely works better now) got me thinking about this painful experience. I decided to try again. There is an updated NORCAL schematic for this rig. I found it (and some good articles) on the NJQRP club page. In the original, designer Jay Rusgrove, WA1LNQ, used only parts that could be found at Radio Shack stores. In the days before the internet and Mouser, this was a good idea. Instead of toroidal ferrite and iron powder coils, Jay built his coils around Radio Shack solonoidal 10 uH chokes. The NORCAL version dispensed with the Radio Shack chokes, and used toroids. But I wanted to try to find out what went wrong 38 years ago. So I dug up some 10uH chokes. I know that my problem was that I never got the oscillator working. I remember being able to hear signals with my "almost" receiver when I put my HT-37 in "CAL" mode and tuned through 40. I was so close! The Herring Aid was picking up RF from the HT-37 and using that in lieu of the LO energy that obviously wasn't coming from my Herring Aid VFO. But WHY didn't that oscillator work? Today I started with the VFO. Again, it didn't work! But now I have decades of troubleshooting experience under my belt. So I poked around a bit. Then I decided to look closely at the phasing. Take a look at the schematic(above) and the picture (below). L7 is the 10uH choke. L6 is 4 turns wound over it (or adjacent to it). Now, here is the key question: Look at the phasing dots. How would you guys connect those coils? For me, the schematic indicates that the TOP of L6 should go to the Zener and the BOTTOM of L6 should go to the drain of the JFET. The TOP of the choke should go over to C5, and BOTTOM of L6 should go to ground. Right? Or am I reading the phasing dots wrong? So, is there an error in that diagram? Was this not all my fault? Aha! I just looked at the schematic of the NORCAL version. Check out the dots! I think that was the problem! The International Brotherhood of Electronic Wizards! 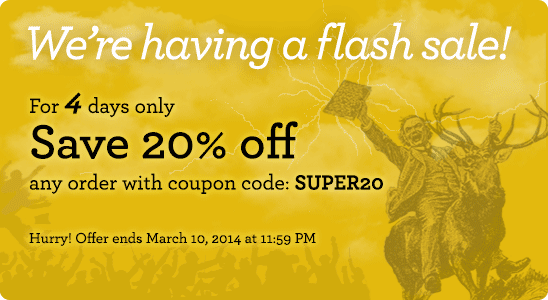 Put your e-mail address here to follow by e-mail! 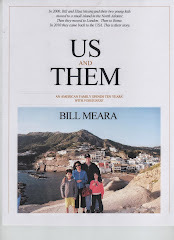 Click on the Book Cover! In response to popular demand, "SolderSmoke -- Global Adventures in Wireless Electronics" is now available as an e-book for Amazon's Kindle. Here's the site: http://www.amazon.com/dp/B004V9FIVW *************************************** For the print version: For shipping from a printer in the U.S. (probably better for N. American buyers) Click here: SolderSmoke USA Version ------------------------- For shipping from a printer in the UK, Spain, or the USA (probably better for UK and other European buyers) Click here: SolderSmoke EU Version The two versions are identical, except for a minor difference in the paper used. That's why the prices are a bit different. Where are the readers of SolderSmoke Daily News? W2LJ QRP - When you care to send the very least! JMJ Mustang Bass photos - Totally off-topic from Ham radio I just wanted to post some photos of a new instrument. Pasta Pete you're in for a Treat!